ISSUE 157 NOW ON SALE! 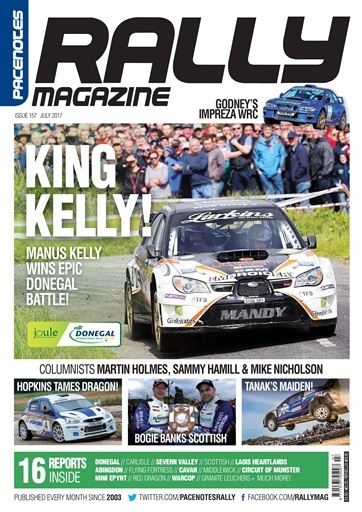 June time is Donegal time and for the second year in a row, Manus Kelly graces the cover of our July edition! The battles throughout the field in Donegal were scintillating, not least the tussle for outright success between Manus Kelly and Donagh Kelly. We've got five pages dedicated to the event, as well as an excellent Donegal Retro article by Kevin O'Driscoll that looks back to the 1992 rally which was won by Bertie Fisher. Also inside, we grabbed a closer look at Ian Godney's Impreza WRC and have some stunning images of his mount, thanks to Jonathan Suter. Our regular columnists are back on board, with Sammy Hamill taking a look at Kris Meeke's difficult situation while Mike Nicholson looks back at his time competing with Tony Pond on the Manx Rally. Martin Holmes provides news from the World Rally Championship scene and he shares some interesting stories from the early days of Rally Poland. We put Carlisle Stages Rally winner, Peter Taylor, under the spotlight, as well as Donegal Junior winner Stephen Peoples plus competitor Bryn Pierce, who organised the inaugural Supercar and Rally Show. Combined with a huge selection of rally reports and photographs from across the UK and Ireland, make sure you don't miss the July edition of Pacenotes! Order print and digital versions online at www.rallymag.com or call 028 4066 0390.